“This new method should be useful broadly,” said Yeates, who is a member of the Institute for Genomics and Proteomics and the California NanoSystems Institute at UCLA. 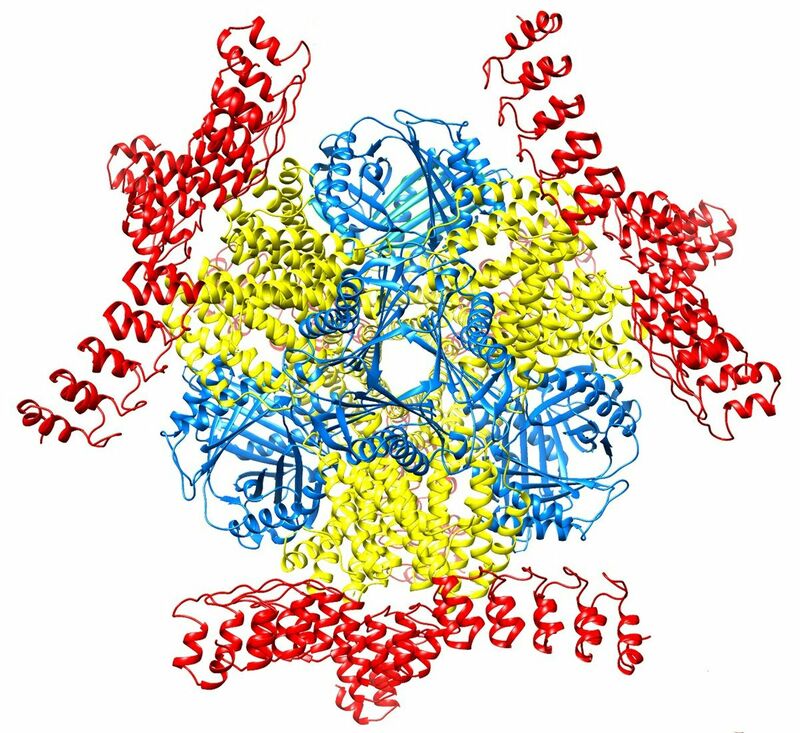 Image depicts molecular “scaffolding.” The molecular cage is in yellow and blue; the DARPin protein is in red. Yeates’ research team published the first research, in 2001, in the scientific field of designing molecular cages built from protein molecules. 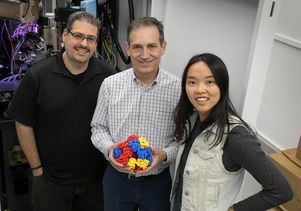 In the new research, his team used “protein engineering” to attach 12 copies of a small protein to a cube-shaped molecular cage, which was designed by a former graduate student of Yeates’. The small protein, called a DARPin, is too small to analyze using cryo-electron microscopy alone. But when the researchers attached the copies to the protein cage, they succeeded in seeing the DARPin with cryo-electron microscopy. “The small protein we attached can itself be made to bind to other proteins, which can then be studied by cryo-electron microscopy,” said Yeates, whose research team is currently working on doing this. Yeates praised as “spectacular” the research of lead author Yuxi Liu, a UCLA graduate student in his laboratory. Co-authors are Shane Gonen, a postdoctoral scholar at UC San Francisco; and Tamir Gonen, a professor of biological chemistry and physiology at the UCLA David Geffen School of Medicine and a Howard Hughes Medical Institute Investigator.